Q & A with Tom Scangarello Jr.
After an afternoon boat ride along the Barnegat Bay, you may find that you see Long Beach Island from a different point of view. One of the most unique aspects of LBI is it’s expansive amount of water. With all of it’s beauty and the effect it has on our senses, we as homeowners and visitors want to know how we can utilize these natural elements to their fullest potential. 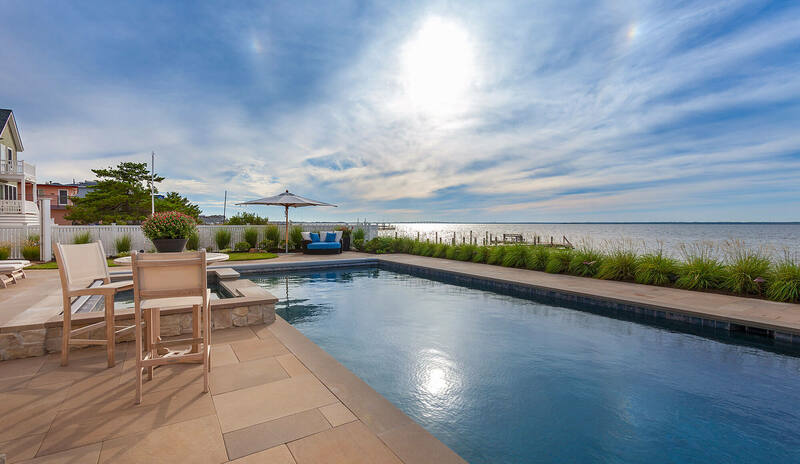 As landscape designers and builders, Bay Avenue Plant Company is always enthralled with the challenge of designing around the water and using the water as an inspiration for their projects. In this North Beach project, Bay Avenue was fortunate to begin with such a beautiful home nestled into a perfect point on the bay. “Each waterfront project has its own feeling and character depending on where the property lies, where the sun sets, and what elements surround you. All of these factors play into how we design a landscape.” says Tom Scangarello, owner of Bay Ave. Plant Co. We asked Tom and the designers at Bay Avenue Plant Company what process they take in designing around the water. Here are some of the key ideas and features present in this particular project. Q: When designing around the water, how do you maximize your view but also make the space functional? A: With any design project, we begin by identifying the key components a homeowner wants to include in their project. This particular project included a swimming pool, hot tub, fire pit, outdoor kitchen and eating area. For a waterfront home, there is an added importance of placement. We wanted to make sure that each component or space in the yard took full advantage of the available view. Each space also had to remain functional. For example, the outdoor kitchen was designed and built with a slight moon shaped arch in it so that every bar stool has a full view of the pool, the bay, and the sunset. Each of the other features were taken through a similar thought process when deciding where and how they should be placed on the property. Q: What was the inspiration behind the overall design of the pool and some of its features? A: When designing the pool, we knew it had to be a custom design. We wanted the shape of the pool to take advantage of the bayfront views, especially the entry points and the hot tub area. We wanted the pool’s water color to have a natural hue to it that looked great with the bay water, but also paired well with the coping and patio work. It was important for this homeowner to have an auto cover for safety. Making sure the pool’s (3) covers worked properly drove some of the overall shape of the pool. Lastly, the pool had to functionally flow well with the other elements of the design we would be building throughout the yard. Q: How do you incorporate plants when designing on the water? A: One of the biggest challenges we face when designing on the water is including a fitting balance of hardscape and softscape. It can be so easy to engulf a property with too much hardscape, such as a stone kitchen or a paving stone patio. Here we were able to balance many of these elements with softer materials and strategic layering. By adding potted plants throughout the patio space, you get small pops of color that grab your attention. We lined portions of the patio and driveway with sod for additional and flexible green space. One of the biggest impacts was the row of Adagio grass that softened the line of the bulkhead and additional taller grasses that surround the fire pit area. In the breeze these grasses create movement, which adds to the calming effect of the surrounding water. Including taller trees along the peripheral edges and the foundation of the home helped to frame and separate the vertical lines of the home from the flat work of the patio. Lastly, we worked with the homeowner and their interior designer to make sure that the patio furniture was identified early on in the project and designed into the project to make sure each piece had a perfect fit. Here, many teak products were used to help soften the overall feel. Q: When installing plant material on a waterfront, what are some of the things that you think about and plants that you like to use? A: Choosing plant material that can survive our harsh off-season weather conditions is a challenge when it comes to coastal living. Some of the materials used in this project were Adagio Grass, Rosa Rugosa, Bayberry, Privet, Eastern Red Cedar Trees and Australian Pines. It’s not so much planting on the waterfront that makes it difficult; it’s the wind that comes off of the water. There are many homes on Long Beach Island that do not sit directly on the water, but can experience the same challenges with plant material survival. When planting on waterfronts or in areas that are highly impacted by weather, it’s a good idea to take advantage of some of the local companies who have a good amount of experience working with more of the native species of plants found in our area. These plants are still here for a reason. Q: How do you choose the type of stone for a waterfront project? A: For this project we used Limestone because of the color tones and the versatility of the product. I personally like using Limestone because it is easy to cut and fabricate for the use of multiple applications. Limestone is clean and crisp; we have used it on contemporary projects as well as traditional projects. On this project it was a good fit for the customization requirements of the pool coping, auto cover boxes and the fire pit cap. The look of the stone’s coloring also matched the vertical veneer stone that was used on the façade of the home. This helped to tie everything together and create a fluid continuation from the home to the landscape.